The current internal displacement crisis in Iraq originated in late 2013 and at present there are 3,171,606 internally displaced persons (IDPs) identified across the country. 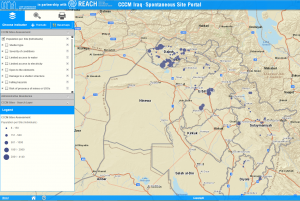 In this context, the Camp Coordination and Camp Management (CCCM) Cluster, in partnership with the International Organisation for Migration (IOM) and REACH, updated the Informal IDP Site Assessment of the Kurdistan Region of Iraq (KRI) which was initiated in October 2014 to support multi-sector interventions in support of IDPs in spontaneous collective sites in the KRI and neighbouring areas of Ninewa and Diyala. The latest update was conducted in August and September 2015, where partners identified and assessed 609 active sites (hosting five families or more) across the KRI. Every site was visited by assessment teams in the field, where a key informant was interviewed to gather information on a standard set of indicators. Partners designed the CCCM Informal IDP Site Assessment Web Portal, to operationalise data collected. On this portal the user can locate every informal IDP site in the KRI, make an area-based site caseload calculation, determine different needs across sites as well as access individual informal IDP site profiles and plan how to reach the site in the field. Partners developed a User Guide to the Web Portal, to facilitate the utilisation of the portal for operational actors. The assessment found an increase in the number of informal IDP sites as well as a rise in the number of critical shelters with vulnerable conditions and households. Since the previous assessment in October 2014, the proportion of sites that include tents and unfinished buildings shelter types have increased respectively from 4% to 13% of sites with tents and 66% to 75% of sites in unfinished buildings. This raises concerns ahead of the colder climate of the winter months, in particular in the mountainous Dahuk governorate which hosts 84% of the informal IDP sites across the KRI. Across the KRI 75% of informal IDP sites were new, while 151 of the 735 previously identified sites still hosted five or more families (with many more still hosting a smaller number that were not assessed). The total caseload of living in informal IDP sites across the region amounted to 51,741 individuals and 8.875 households. Although the proportion of sites with no tenancy arrangement has dropped, from 54% to 16%, the large majority (79%) of these are still informal arrangements. Indeed, 19% of sites reported that they had been threatened with eviction. Access to services across sites remains poor; 13% of sites reported that everyone at the site is affected by water shortages, while 12% reported electricity shortages. Thanks to this assessment, which identified thematic needs and access to services of IDP households residing in informal settings, service delivery of humanitarian actors in these sites will be based on evidence and this will in turn enhance the provision of humanitarian assistance for IDPs residing in informal sites across the KRI.